An old watermill on the river. The river cruise leaves from a few hundred meters away. From the top of the hill where the old Cathedral is, one can look out towards the Straights of Melaka, still a major shipping route. China is so concerned about the possible blockade of this route that it is aggressively building transportation infrastructure over land to access the Indian Ocean (See: Where China Meets India: Burma and the New Crossroads of Asia). It makes sense why this place changed hands so many times over the years. Today, as part of a unified Malaysia, it maintains the odd mix of cultures that once claimed this port town. The No. 17 bus from Melaka Sentral Bus Station drops you right in the thick of it, in Dutch Square. Here you have your stalls with sunglasses and t-shirts, taxi drivers soliciting, and droves of tourists looking at the reddish colonial-era buildings. As you walk over the bridge, past the Hard Rock Café, you run into the line for a Chicken and Rice restaurant that must be very good. This is the mouth of the Jonker Walk, the main attraction of Chinatown. A large model sailing ship sits in the center of the roundabout. The line to the Chicken and Rice restaurant, the model ship, and the Jonker Walk. It can all be done in a day. I won’t list the sights because any guidebook or even wikitravel.com could tell you exactly where to go. The weekend is especially fun to witness as tourists stomp through the heat to see all the old buildings and museums, maybe a river cruise in the afternoon, and then converge on Chinatown for the Jonker Walk – a large outdoor market – when the streets are closed to cars at night Fridays, Saturdays, and Sundays. I’m not separating myself – I did all the stuff (except for the river cruise). I coast along Jalan Hang Jebat (the Jonker Walk), grabbing some food, eyeing trinkets, art, fruit, ice cream, and steam irons. Some unique buildings in Little India. When I wake in the morning and poke my head out the window, garlic and spices waft up from the street. It arouses my appetite. On Monday the town is quieter. I get breakfast and stick out like a sore thumb, trying to figure out how to eat noodles in a broth without getting it all over my shirt. They are mostly tea drinkers here, but the big white guy likes his coffee. Little India has restaurants (that are delicious), shops, hotels, and all the other things that Chinatown has, without much in the way of tourist attractions . I walk around and snap a few photos, baking in the heat. I find myself returning to the calm of the river throughout my stay. I wearily eye the Hard Rock Café and then walk along the water. There are restaurants and hotels along the banks, but not as many as one would assume. Many of the buildings are decorated with murals, and some of the buildings are decrepit. There were probably more buildings on stilts back in colonial times, but the walk along the river feels timeless in many ways. Colorfully painted buildings along the river. 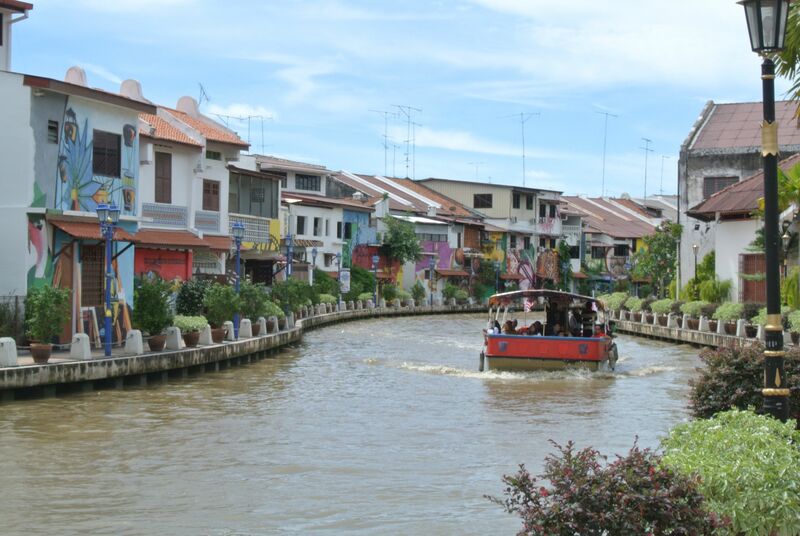 Melaka is a town with many identities, and it seems rather proud of that. It has changed hands several times over the years and is home to many ethnic groups. Both the tourist industry and the local government seem willing to weave outside influences into their oeuvre. As you buy your ‘I ♥ Melaka’ t-shirt, you gaze up at the big banner proclaiming, “Don’t Mess With Melaka,” and realize that you are neither in New York City nor Texas, but Melaka, Malaysia. This entry was posted on November 13, 2014 by alexjparton. It was filed under Asia, Malaysia, Travel and was tagged with asia, chinatown, colonialism, jonkerwalk, littleindia, malacca, malaysia, melaka, straightsofmelaka, tourism, tourists.